Millions of adults suffer with tooth loss; it can be unattractive, embarrassing and painful. Tooth loss can cause various problems – difficulty eating, ill-fitting dentures and less of an active lifestyle. Missing teeth can vastly affect ones confidence and self-esteem. Dental implants provide a straight forward, longer lasting solution to missing teeth than traditional methods such as dentures and dental bridges. So what are the options for missing teeth ? Dentures are very commonly used by millions of people for missing teeth as they are the ‘traditional’ choice for missing teeth. Removable dentures, are made of acrylic or a metal alloy (usually chrome cobalt). Dentures are removable and need to be cleaned regularly & after meals. A Removable Denture can replace a single tooth, multiple teeth or a full arch of teeth. Although dentures are relatively simple to make, dentures are different to real teeth. Dentures tend to move while eating and can cause sore spots on the gums. Dentures can affect the way you speak and chew your food. Dentures cover the roof of the mouth (palate) where many taste buds are found so by covering these taste buds dentures also reduce the ability to taste food properly. Because the dentures are not connected to the jaw bone in any way, the bone in our jaws will resorb or shrink over time. This shrinkage of bone volume can affect your appearance or facial profile over the long term. 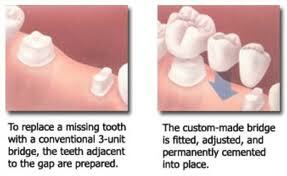 Fixed Dental Bridges are a more permanent solution to missing teeth. Unlike dentures dental bridges are usually fixed and do not move during function. Fixed Dental Bridges can replace single or multiple teeth however it is not recommended to replace many teeth in succession. 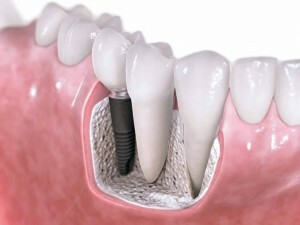 Dental bridges require healthy adjacent teeth to be filed down to provide a foundation to support the replacement teeth. In order to be able to have a bridge the missing tooth space needs to have healthy adjacent teeth that can support the fixed bridge. If there are no sufficiently strong teeth ‘behind’ the missing teeth space then a bridge would not normally be possible. Bridges are supported by the adjacent teeth so it is important that these teeth are also strong and healthy. The supporting teeth need to be prepared or ‘filed’ down in order to support the bridge. The prepared teeth are likely to fail eventually causing further problems and more teeth inevitably need replacing. A Dental Implant can replace a single tooth without any impact on other healthy teeth. Dental implants can also replace multiple teeth as they act like artificial tooth roots. Implants can support a single implant crown, small bridge or even a full arch bridge. Missing teeth cause bone loss in the jaw and traditional solutions do not address this problem. Dental implants however stimulate the jawbone preventing atrophy and preserving the natural facial features. Dental implants are placed into the jaw bone, because they are fixed into place they are more comfortable than removable dentures, making it easier to eat and speak. Dental implants allow you to eat whatever you want and look feel and function like natural teeth. Dental implant treatment is a predictable and long term solution to tooth loss. Dental implant treatment can be carried out under local anaesthetic or sedation. Treatment usually takes between 3-6 months to complete. More complex treatments can take longer to complete if bone grafting is required. With a 95% success rate dental implants are the most reliable solution that are the closest solution to your natural teeth! Dr Bruno Silva works at Brighton Implant Clinic working exclusively with dental implants. We provide affordable dental implants in the UK starting from £995 for single teeth dental implants. For a full outline of prices please see our Dental Implant Prices or Feel free to Contact Brighton implant Clinic. Reading through your impressive site you don’t mention age limitations so I’m wondering if I might be suitable for your free examination please? I’m 75, very active and as a Musician play in a Folk/Blues band. However, my teeth are in a very bad way and I have been wearing a partial bottom plate for many years. Did try a top partial denture once but couldn’t cope with it! or am I, as an ol’timer, past any major treatment? Hi Lyn, Please contact one of our three clinics with any questions and for any further information on dental implant treatment. We offer a free consultation including a Panoral X-Ray and we will be happy to help. can you fit dental implants for a person who has a full mouth of dentures since the age of 16 – now aged 64 ? and would this be successful?